While other students are celebrating the end of the University year relaxing with friends, Nathan Harrison and Camilla Trenerry went straight into a men’s health summer vacation research placement, to gain valuable research experience and inform decisions about their future study and career. 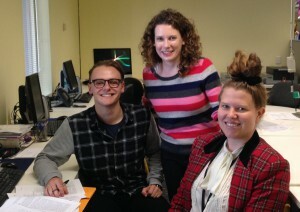 Both Nathan and Camilla are 3rd year Psychology Honours Program students at the University of Adelaide and their summer placement research is looking at health help-seeking behaviours in rural communities. Specifically, they are undertaking a systematic review of the published literature to investigate measures of barriers to seeking support for physical and mental health. They are being supervised by Dr Kate Gunn,Cancer Council SA Post-Doctoral Research Fellow at the Flinders Centre for Innovation in Cancer, Flinders University and Associate Professor Jim Dollman, Health Sciences, University of South Australia. Both Kate and Jim have research interests in farmer health and well-being. A review of this sort does not exist in the literature to date and therefore this will be very useful, not only for the Farmer Health research program in the Centre but also for other researchers. This entry was posted in News, Research and tagged farmers, health behaviours, rural health, summer vacation research. Bookmark the permalink.